I remember teachers asking the question, “What is the largest human organ?” in class many years ago, and most kids shouted out incorrect guesses, like the stomach or the brain. While the largest internal human organ is the liver, by now we should all know that the skin is the actual largest organ. There has been a lot of research into 3D printed skin, which is great news for burn victims, those suffering from skin disease, and those who want to hold on to to their youth. Bioengineers have been looking into different 3D printing techniques to produce synthetic human skin for years, as it could also help with reconstructive surgery. 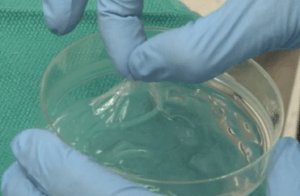 A research team from Pohang University of Science and Technology(POSTECH) in South Korea, no stranger to 3D printing research, has just introduced an innovative single-step process for 3D bioprinting synthetic skin. The POSTECH team recently published their work on the breakthrough process in a research paper, titled “Direct 3D cell-printing of human skin with functional transwell system,” in the Biofabrication journal; co-authors include Byoung Soo-Kim, Ge Gao, Jung-Seob Lee, and lead author Dong-Woo Cho, who was also part of a team in 2014 that developed a 3D printed scaffolding implant that was used to help realign a patient’s eyes after a tumor removal.